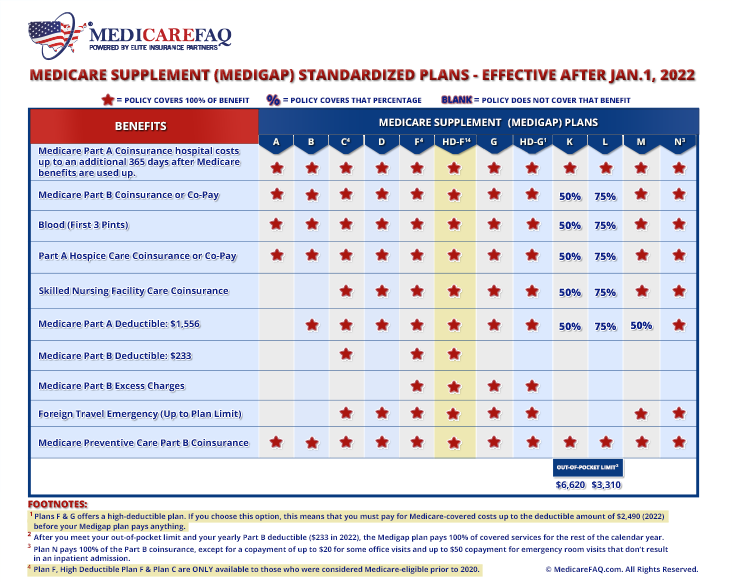 Medigap Plan F High Deductible is the alternative version to the standard Plan F. With Medigap Plan F High Deductible, once you reach the deductible, your benefits will kick is the same way the standard Plan F would. Many beneficiaries like the benefits of first-dollar coverage plans, like the standard Plan F. However, those Medicare beneficiaries who are mindful of cost might choose the high deductible version of Plan F. With High Deductible Plan F, you consume the early costs. Medigap Plan F High Deductible works the same way all other Medigap plans work. Medicare pays 80% of your medical costs, your supplement plan will take care of the remaining 20%. The only difference with Medicare Plan F High Deductible is you agree to pay the deductible first. Once you reach the deductible, your Medigap Plan F High Deductible will cover the left-over costs going forward. This keeps the monthly premium low. The deductible for 2019 is $2,300. Therefore, your maximum out of pocket costs is going to be $2,300. Once you reach this deductible, the plan will cover 100% of your shared costs. For example, lets say it’s time for your routine colonoscopy cancer screening. Your Medicare Part B covers colonoscopies every four to ten years for those at average risk. The average cost of a colonoscopy is around $3,000, depending on your geographic region. You’ll be responsible for the first $2,300 of the total amount. This would also include your Part B deductible. Once you reached your maximum out of pocket limit, your High Deductible Plan F will pay the remaining costs. Any other medical costs you incur throughout the rest of the year will also be covered at 100%. Each year Medicare adjusts the deductible amount, it slowly increases year over year. Aside from the deductible, the costs for High Deductible Plan F is the monthly premium. The average premium for Medicare Plan F High Deductible is around $50. Depending on your state or residency, it could cost a little less or a little more. There are many factors that come into play when it comes to Medicare Supplement premiums. Factors include location, age, gender, etc. Each carrier offers different Medicare Supplement Plans in different states. One carrier might offer this plan in one state, but not another. Regardless of the carrier you go with, the benefits and deductible amount will remain the same. The difference between carriers is the premium. That’s why you need to a licensed agent to help you compare rates in your area. We work with all the top carriers, we can compare rates side by side to help you find the best plan for your needs and budget. If you’re enrolled in Medicare Part B, you’re eligible for Medicare Supplement High Deductible Plan F. Medicare Supplements don’t have specific enrollment periods like Original Medicare, so you can enroll anytime. However, the best time to enroll is within the first six months your Part B is in effect. During this time period, you’re given Guaranteed Issue. This means that regardless of any pre-existing conditions, a carrier must approve your application. Again, you can still enroll after this time period. Keep in mind, there are some medical questions during the application process. Your premium might increase if you wait to enroll as well. Many Medicare beneficiaries have probably heard the news about first-dollar coverage plans. Beginning in 2020, all first-dollar coverage plans will be discontinued. This includes Plan C, Plan F & HDF. However, this change will not impact beneficiaries who are already enrolled in one of these plans. They’ll be grandfathered in, and the benefits will remain the same. You’ll continue to have zero out of pocket costs. Another important fact to note, beneficiaries that are considered Medicare “eligible” prior to 2020 can still enroll in one of the first-dollar coverage plans after 2020. If you turned 65 in 2019 but didn’t enroll in Part B until after 2020, you’re still able to enroll since you were technically Medicare eligible prior to 2020. Rumor has it, there will be a new High Deductible Plan available starting in 2020. There’s been unconfirmed talk in the Medicare space about a new High Deductible Plan G.
If you’re looking for an alternative to Medigap Plan F High Deductible prior to 2020, your next best option would be Plan G, the standard Plan G that is. (since there’s no such thing as High Deductible Plan G, yet.) It’s not as cheap as High Deductible Plan F, but it is cheaper than the standard Plan F.
You’ll have to decide what’s more important to you, spending less in monthly premiums and having higher upfront out of pocket costs, or spending more in monthly premiums to have a minimum to no out of pocket costs. Our licensed Medicare agents are here to help at no cost to you. It’s like having your own personal Medicare planner in your back pocket. When you sign up for any Medicare Supplement Plan through us, we’re in it with you for the long haul. You’ll get on-going support from our expert Client Service Team. If you have any problems with your coverage or submitting a claim, we’re here to help. Give us a call now at the number above. You can also see a comparison, side by side, of all the rates in your area by using our online rate comparison tool here.